Article reprinted with permission from Nebraska Extension Acreage Insights and Acreage Living Newsletter. Our tree leaves are coming down, but don’t throw them away - put them to work for you. We’ve talked about creating a traditional compost pile in the past, but if you only have a small amount of yard waste consider bag composting. Perhaps the easiest way to compost is by putting fall leaves in black plastic bags. Keep in mind this is a passive composting method, so the leaves will break down more slowly, but it also requires much less work from you. No turning materials with a pitchfork, as you would with a traditional compost pile. As with other types of composting, shredded leaves work best. 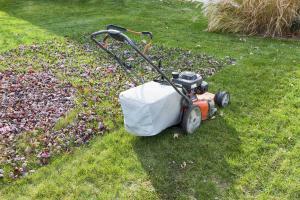 Smaller pieces of leaves break down faster, so run over the leaves and collect them with your lawn mower. Then fill 30-40 gallon sized, black plastic bags (3 ml. thick) with leaves. In each black plastic bag add in about ½ cup high nitrogen fertilizer or two shovels of manure. Fertilizer or manure provides nitrogen microbes need to breakdown high carbon tree leaves. Add two shovels of garden soil to provide the microbes needed for decomposition. Finally, add about 1-2 quarts of water to each bag. Composting microbes also need water to be most active at breaking down you leaves. You have a choice with bag composting to create either an aerobic or anaerobic condition. Aerobic decomposition requires oxygen, greater than 5%. The advantage is that there are no bad smells, since methane is not generated during aerobic decomposition. And your materials will break down faster; approximately 4 to 6 weeks. Anaerobic decomposition, with less than 5% oxygen, does generate methane and is slower. But there is no maintenance once your bags of leaves are put together. Material in the bags will require 6 to 12 months to decompose. With either method, materials will break down more quickly if the bags are placed in a heated garage during winter. There are two methods that can be used to create aerobic decomposition in a black plastic bag. Whichever you choose, fill the bags as mentioned above, adding fertilizer or manure, soil and water. The two methods below differ in how oxygen is provided during the composting process. Your finished compost should be ready in approximately 4-6 weeks. Method #1 - Punch 12 to 15 holes in the side of each bag once they are filled and closed. Turn the bags every few days to remix the materials inside. Method #2 - A second method is to leave the bags undamaged, but open them every other day to check moisture levels and allow oxygen to enter. If the materials are too wet, leave the bag open for a day or two to allow some moisture to evaporate. Turn the bags every few days to remix the materials inside. When putting your bags of leaves together, add the soil, fertilizer and water mentioned above, then also add 1 cup of hydrated lime. Lime helps counteract the acidity created during anaerobic composting. Tie the bags closed and place them in an out-of-the-way corner of the garden for 6-12 months. You won’t need to add anymore water during the composting process. Leaves in the process of composting can also be placed in plastic bags and used around tender plants to provide extra winter protection. In bags, the leaves are protected from moisture so they don’t become matted or compacted. Place the bags around plants that need protection from winter wind, such as roses or broadleaf evergreens.